As 6.9 trillion gallons of water fell in Louisiana last week, hundreds of pets fought to keep their heads above water. An early estimate determined more than 600 animals have been rescued from the history-making Louisiana floods. The animals include both strays and pets whose families are no longer able to care for them. As local animal shelters quickly filled up, several shelters from across the country came together in a nationwide effort to give the rescued animals a second chance at life. The SPCA of Dallas was one of those shelters. Last week, they sent representatives to Louisiana to conduct a rescue mission in Baton Rouge. They rescued 50 homeless dogs and brought them back to Texas. The dogs were scared, weak, and many suffered from heartworm and kennel cough. After a week's worth of medical attention and rest, however, those dogs now have a new lease on life. They're waiting for forever families at the SPCA of Dallas. You can find pictures of the animals on their website. "More than anything ... the city of Dallas can really step up and help by going in and checking out some of the amazing Louisiana dogs that they are going to have up for adoption." Across the country in Norfolk, Virginia, more animals displaced by the floods are waiting to be adopted. 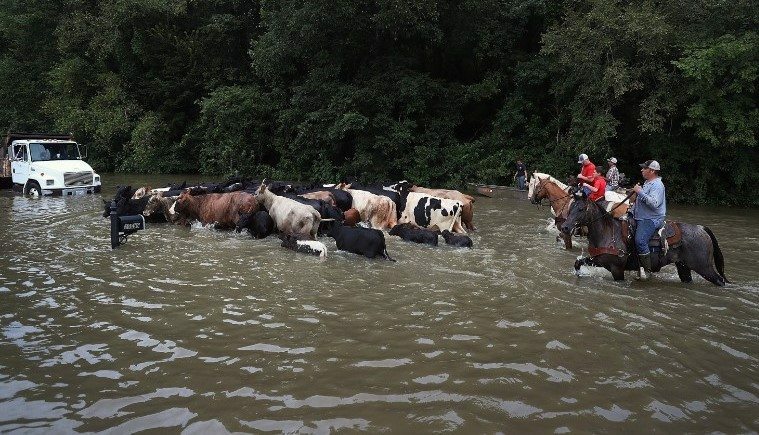 A rescue team from PETA waded through the floodwaters in Baton Rouge to reconnect lost pets with their owners. They also helped an overcrowded shelter by transferring animals to the PETA headquarters in Norfolk. 35 dogs, 20 cats, six rabbits, and one cockatiel are still waiting to be adopted in Virginia and North Carolina. An animal rescue group in Roanoke, VA also ended up taking in a group of homeless dogs after a van--that was headed to Washington D.C.--broke down on the road. Angels of Assisi is now the temporary home to 38 canine flood victims. They're also anxiously waiting to be adopted. While many animals were safely transported out of Louisiana, the local shelters are still overwhelmed with the number of animals in need. Many animal shelters have been shut down due to the flooding--making the situation even more dire. At the Denham Springs Animal Shelter, staff and volunteers were forced to unlatch all the kennels as the flood waters quickly rose and overtook the building. By unlatching the doors, the dedicated staff gave the animals the chance to swim and find refuge on the roof. With so many animals in need of help, shelters, PETA officials, and animal advocates everywhere are asking people to open their homes to these animals in need. All pets displaced by the Louisiana floods are available for adoption or fostering. In addition to adopting, you can also help the cause by donating. Many GoFundMe pages and Amazon Wishlists have been set up for affected animal shelters. The shelters need things like shop vacs, pet supplies, and money to start repairing the damage. If you're ready to adopt a new dog, cat, bird, rabbit, or horse, now is the time. There are hundreds of newly displaced animals waiting to call somewhere home.